I made this frame from a gift box for my Cousin. The mirrored print is behind glass and the rock tumblers are set in their morticed shelves. The frame is white oak with black dye and two coats of wipe-on poly…..
Michael, I just checked them both before setting them up there. They both held about 3 fingers each….. Considering you don’t know JACK…. I like the asymetrical right side to accomodate the glasses & how the mirror is positioned. This looks fantastic!!! Your cousin (Kissing Cousin??? ), is going to love it. What kind of dye did you use? Do you think it would work well with red oak? I have some red oak ply I want to stain/dye dark grey/black and need to find something. Thanks Randy, And HE has a large JD collection in his home bar. The dye is Master Solar-Lux. Red oak would take it as well as the white. It’s a great way of coloring the wood and still have the aggressive grain of the oak….. Thanks for the info on the dye. You still didn’t answer the “Kissing Cousin” question!!! Good one Marty…..The Kentucky folk are still mad about the JD…not being real Bourbon and all….. but it’s still my fav. Cool piece…...here’s one I carved on the CNC last week…..a fridge magnet with some bad sanding….. Very cool Marty. The “black” oak is perfect for this! 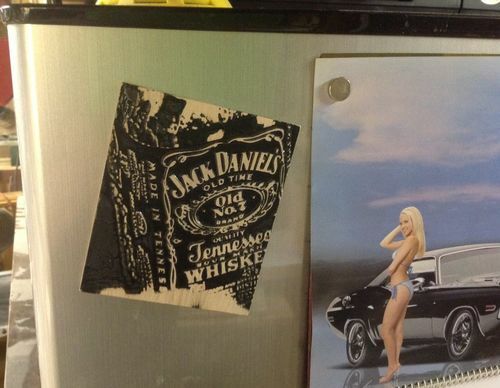 Jeff, I like yer other fridge mag better! Nice car! I like the dye job. If you pore a half a shot in the glass. Is it half empty or half full? Nice work, Marty. I like it.